Reflections on Medical Oncology: 25 Years of Clinical Trials – Where Have We Come and Where Are We Going? 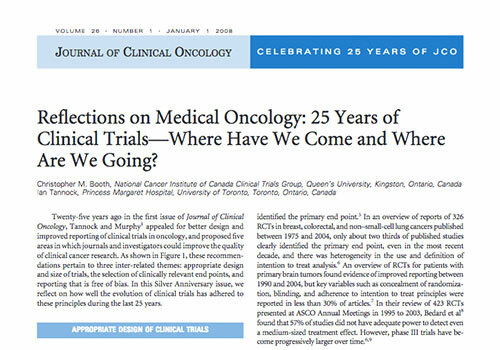 Twenty-five years ago in the first issue of Journal of Clinical Oncology, there was an appeal made for better design and improved reporting of clinical trials in oncology. Those recommendations pertained to three inter-related themes: appropriate design and size of trials, the selection of clinically relevant end points, and reporting that is free of bias. In this Silver Anniversary issue, the authors reflect on how well the evolution of clinical trials has adhered to these principles during the last 25 years.